A Papua New Guinea Governor is boycotting the signing of a reviewed Memorandum of Understanding (MOA) with Tolukuma Gold Mines in the Central mountains of PNG, operated by multi-billion kina South African gold mining company, Emperor Mines. Governor Alphonse Moroi says he will not sign any agreement with the mining company that will continue to allow toxic waste to be dumped into the Auga and Angabanga river systems. Moroi is pushing for a tailings dam to be built and if successful Tolukuma would be the first mine in PNG to have a tailings dam. He says PNG must learn from the experiences of its former giant mines including Bougainville Copper Mine and Ok Tedi which operated without a tailings dam, resulting in huge environmental and economic losses. Moroi is adamant the levels of heavy metals have accumulated in the river systems throughout the Tolukuma operations in the past 10 years. “I will not sign a document that will have detrimental effects on the livelihood of my people,” he said. But PNG’s Deputy Prime Minister and Mining Minister Dr Puka Temu signed the MOA on behalf of the PNG state. He told representatives of Tolukuma Gold Mine that Governor Moroi and the Central Administration were not available for the signing due to certain disagreements. The Tolukuma gold mine is located about 90 kilometres from Port Moresby, but there are no roads linking it to the PNG capital. Instead, the mine operates on a fly in fly out basis. 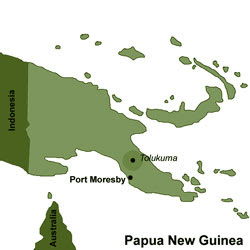 Moroi in his first term as governor had negotiated for the mine to construct a road from Tolukuma to Port Moresby but the company refused to do so. In 2005, Governor Moroi engaged a consultant to conduct a study into the mysterious deaths of river communities. The study carried out by pathologist Dr Sylvester Kotapu revealed that the blood samples from the people who had direct contact with the river showed high levels of toxic lead including mercury. Tolukuma Gold Mine has since denied the mine is responsible for the contamination.